This is journey of a Mumukshu - the person who is desperate for the realization of Supreme Truth - Aham Brahmasmi, Advaita, the oneness with Supreme Power - The Moksha. On this path, when the purification of mind starts, we feel regrets and sometimes guilty, or generally these feelings disturb and make restless most of us. The only solution is to surrender these feelings to The Almighty or The Sadguru. The moment when the mind is surrendered completely the life changes completely. We discover the peace which is already inside us, not different from us. Life becomes the happiest, every heartbeat the happiest one. Such person who is free from all the conflicts spread the bliss everywhere, and can change or renovated lives of others too. In fact this happens naturally, by that person who is Mukta. This is process is not the one day process. By the Mukta person, the peace spreads on the earth. All the feelings are vibrations of that feelings spreading on the earth. Mukta person has only peace and bliss to spread. 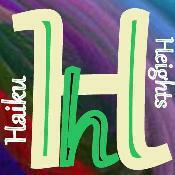 Your haiku is pure meditation!